Can We, The People, Take Back The Internet? Zach Giles spends a lot of time on rooftops. He's one of many volunteers for NYC Mesh -- helping to spread the word that people don't have to rely on traditional ISPs to get online. With the death of Net Neutrality rules, there has been a grassroots resurgence of interest in community networking. Internet users from all walks of life and all corners of the country are worried about the ever-tightening grasp that megacorporations like Verizon, AT&T, and Comcast have upon the backbone of modern society, the Internet. In pockets here and there, people are starting to take back what was theirs in the early 1990s. Around the turn of the 1990 decade, thousands of small-time entrepreneurs and hobbyists made the leap from dial-up Bulletin Board System operators to Internet Service Providers, connecting their neighbors - who still dialed in using analog modems - to this world-spanning “network of networks.” They were people who cared about people, who went out of their way and stayed up all night to make sure their customers were well taken care of. 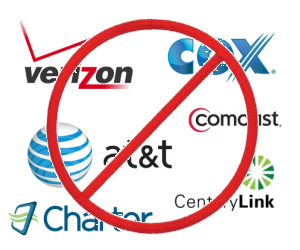 Those neighborhood ISPs are mostly gone now, replaced by remote, faceless corporations whose only concern is how much of our money they can convert into “shareholder value.” Never before have they had so many friends - or servants - in positions of power to grant their every wish. The public’s Internet has become a corporate cash cow. But some rebellious folks just aren’t having that! Kaleigh Rogers, a writer for Motherboard, says "We are so used to the internet being this other thing, run by private businesses. But there's no reason why it has to be. You know, the core infrastructure that rigs up the whole planet with internet, anyone can connect to it." How Does a Mesh Network Operate? NYC Mesh bought a gigabit-speed connection to an Internet Exchange Point (IXP). From an antenna called the Supernode, perched atop the IXP’s tall building, NYC Mesh broadcasts to an ever-growing mesh of WiFi access points. The access points connect home WiFi networks to the Supernode, and to other nearby access points. NYC Mesh’s coverage expands from its edges outward as new access points even further from the Supernode come online. Their Internet is faster than yours, unless you’re paying hundreds of dollars per month. Download speeds of 80-110 Mbps are standard. There are no data caps or overage charges to worry about. NYC Mesh will not prioritize one service over another. It also won’t log its customers online activity. NYC Mesh saw a spike in requests to join its mesh last December, when Net Neutrality rules were repealed. The group had about 500 requests in all of 2017; so far in 2018, over 1,300 New Yorkers have asked to join NYC Mesh. Miraculously, donations keep the whole show running. This is a community-owned network, not a shareholder-owned profit machine. All of the volunteers have day jobs, just like the BBS sysops from the dial-up days. Once you pay for that IXP connection, the Internet does not cost a lot. A case in point is a video production company that owns a building within sight of the Supernode. The big ISPs wanted tens of thousands of dollars to install and lease the ultra-fast connection that modern digital video production requires. NYC Mesh got the building connected for an installation fee of a few hundred dollars and a promised monthly donation. NYC Mesh recently erected its second Supernode antenna, connected to another IXP in Brooklyn. This map shows NYC Mesh’s messy but impressive coverage area. NYC Mesh is not the only urban community network. Detroit’s Equitable Internet Initiative is bringing Internet access and technical career training to some of the poorest neighborhoods in that long-struggling city, where 40% of residents have no Internet access available to them, even if they can afford to pay. During Detroit’s economic meltdown, the big telcos and cable operators saw no profit in bringing Internet to the city’s poorest neighborhoods. Miles and miles of “dark fiber” lie beneath the streets, fiber optic cables that see no Internet traffic; those cables were laid decades ago in anticipation of a boom that became a bust. But now, a dedicated team of volunteers is going door to door, recruiting trainees for a 20-week course in wireless network engineering. Graduates become “digital stewards” of their neighborhoods, helping others get online and learn how to use the Internet. The Equitable Internet Initiative is operated by the Detroit Community Technology Project, which is funded by grants from Allied Media Projects. Customers pay if they can, but are not turned away if they can’t. Perhaps the largest community network in the world is Gulfi.net, with over 34,000 users in the Catalonia and the Valencian Community of Spain. Gulfi.net is growing without regard for national borders. As of April, 2017, Gulfi.net claimed 46,000 kms of wireless links (presumably, the total of estimated distances between nodes) and more than 33,000 nodes. Community networks are a counterpoint to corporate assimilation. If you have a tale of another community network initiative, I invite you to tell it in the comments below. Most recent comments on "Do You Really Need an ISP?" I presume some sort of federal licensing or permitting is required for a Mesh Network. Is there some way to find out where Mesh Networks are operating or being planned? This is a great idea, but with very limited application for most. It clearly requires extensive technical know-how, access to expensive enterprise-class networking equipment, rack space in which to assemble the gear and money to get it all going. Oh, and you must be near enough to an Internet Exchange Point to make the connection feasible. I live in a rural area with a small telco as the only ISP. You either connect over their fiber network (a rare and expensive thing in rural areas) or through a satellite service for which the telco is the local dealer. The nearest IXPs are in one of two big cities, each 90 miles away. I don’t think one of these mesh networks will be saving my neighbors and I from the local telco any time soon. I'm in! I'm retired but would love to take the 20 week course! I tried a similar approach about 10 years ago, using Meraki access points. Due to lack of interest it went nowhere. Anything for Canadians in there. Or is it just for the big US cities? This will work great in Utopia. Remember, your ISP (or one to many of the nameless operators of the mesh) can see all your data. You might not like your ISP, but you have a real entity if there are issues. I agree with Joe. Our internet access is limited to satellite. The ADSL is so oversubscribed they aren't even allowing hookups in our area and Century Link (despite what they told us when we originally signed up) has no plans to improve service.....ever! So how do you even go about locating these access points? Is there a way to find out the requirements for setting up such a system legally and equipmentwise? I tried Google to absolutely no avail. If I click the Back Arrow It does not work, but if I right click on it I can go back to your page with no problem. Once I am back on your page and right click on the Forward arrow it shows "Microsoft Official Support". Best news I've had in years. It is a move towards retaining internet comms in the case of enemy attack or even a hostile home government. Next steps are to duplicate the very backbone of the web: the dns servers. And the IXP itself. There's no explanation of what that is. But if we have to buy a connection to it then we can be locked out I assume. So we need our own. We need viable alternatives to the web. i.e. we need to make it impossible to silence us. The web is our greatest strength at the moment. Hence it is also our greatest weakness. Missing from this article is the most-important part: How much does it cost to buy a connection to an Internet Exchange Point? OFF TOPIC: but a laugh. If I don't recognize an incoming phone number, the answering machine handles it. Most of the time, there's a simple click, telling me it wasn't important. However, this afternoon, I got an *important* call. I am due a refund. The company, "Microsoft," is going out of business. Dumb scammers. Big MS will *never* go out of business--at least not in my lifetime. The woman thought I was dumb enough to believe her spiel. Maybe I'll answer next time and possibly be able to "yank her chain." Ha. In the Philippines the internet is controlled by 2 Telcos and service has been very bad. The Rural areas have no access whatsoever to the internet. What does it take, and how much, to start something like this? A ton of info on Google if you search for the correct thing. I was excited to read that Catalonia/Valencia are connecting, but gulfi.net takes me to a history of the Gulfi family. Did you mean Catalonia in Europe (where I live) or is that a neighbourhood of NYC? There are few things I despise more than being beholden to these "big guys" for internet access. An alternative such as this would please me immensely. It may not be much, but it's a start. I'm hoping it will develop and spread from these beginnings and inspire others to help attain freedom from these greedy providers. What about this "5G" thing I've been hearing about; is this going to be basically a Telco-controlled 'mesh' Wi-Fi network? Bob, Your articles are usually very helpful but this one leaves me with more questions than answers. Perhaps you could write more in depth about what would help the rest of us such as how to find local 'mesh' type services etc. Knowing that Detroit & NY have a good community internet doesn't help me at all! I worry about what's going to happen once the net neutrality rules go away! A fixed income only goes so far! Bob, Just wanted to know why you never answer any of this content? Also, so if I put up any comments and you and yours don't agree with what I have to say than it's like it never was. Or worse yet you edit my content to suite you. EDITOR'S NOTE: Quite often, other readers chime in on comments, or answer questions raised here. I do the same when I have something to add. And for the record, I can only find that you've commented here twice in the past two years. I've never edited or deleted anything you've posted.